Prestigious estates, a luxury hotel with a 2-starred Michelin restaurant and tasting school, the “Cercle Lynch Bages”… Jean-Michel Cazes bought back and renovates the derelict buildings and boutiques from his childhood. Thus, brought back to life, the Bages Hamlet is now one of the most visited destinations in the Médoc region. Jean-Michel is a true pioneer of refined wine tourism to which he brings a lifestyle element. He was even awarded a prize for it by the “Revue des Vins de France” in January 2011. The “Café Lavinal” (named in remembrance of his great grandmother) is a great spot for lunch, with its retro moleskine décor, zinc bar, chalk board menu and wine by the glass. For a stylish dinner, go to the Cordeillan Bage Michelin Relais et Châteaux restaurant, where the chef Jean-Luc Rocha, awarded the prestigious commendation of “Meilleur Ouvrier de France”, has just taken over from Thierry Marx. 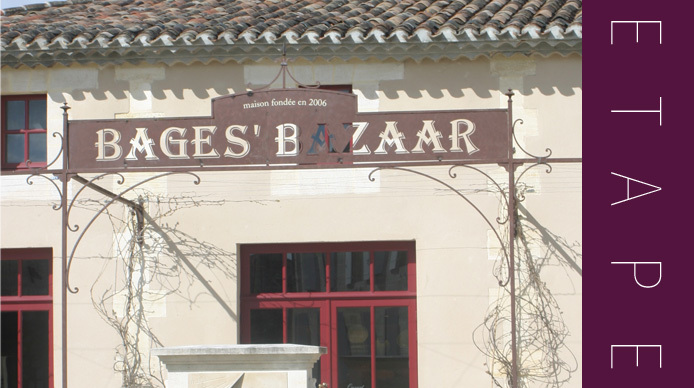 The “Baba d’Andréa”, an old fashioned bakery and the “Bages Bazaar”, a boutique where you’ll find a selection of attractive objects related to wine, come to complete the renaissance of the village of Bages. This grand building was constructed in the 18th century and owned by Jean François de Pontet, a royal governor of the Médoc region. Guy Tesseron took control of the estate in 1975 and today, with his son Alfred and nieces Mélanie and Philippine, the passionate family tends to the 81 hectares plot. The vineyard is made up of cabernet sauvignon, merlot, cabernet franc and petit verdot varietals. Today more than 40% of the land is worked exclusively with horses, and 100% of the land is cultivated using biodynamic practices as the estate has dual certifications in both the Biodyvin and Ecocert methods. Jean-Michel Comme, régisseur of the domaine, likens the estate’s viticulture practice an a human adventure and intellectual practice in where they monitor the growth of the vines as they would raising a child, with much attention and care.